The school year is in full swing and I cannot believe I have started my fourth year a 1st grade teacher. Over the past few years I have been involved with RAFT and have been lucky enough to have taken classes and have had the opportunity to use many of their Activity Kits. RAFT has such an abundance of kits and idea sheets to choose from I have decided to tell you about some of my favorite kits. I have used these kits in my classroom for years and I would love to explain and show how I apply the kits to the first grade curriculum. The Add It Up kit is a great math tool for my first graders. This kit includes a game board, two different types of dice, and game markers. 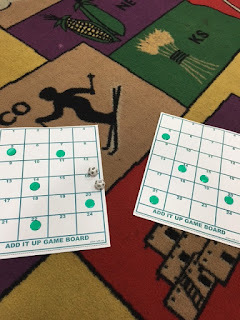 Students roll two dice and they add the two numbers together. 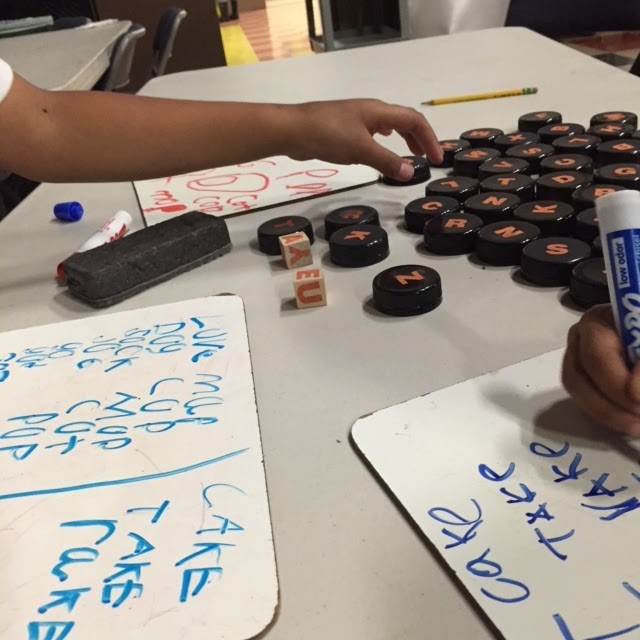 Once they figured out the sum, they use a game marker and place it on the number on the board. For example, if the student rolls a two and a four, they place a marker on the six on the board. This is a great tool to help with number sense and addition. I have used it in math centers and early finishers love to play this on their own. The best features of this kit are students can work in groups or independently and it can be differentiated. The game board has two different sides, one goes up to twelve, the other side goes to twenty-four. It is definitely an essential kit that enhances my student’s learning and it offers an interactive way to practice these math skills. Another essential kit that I could not teach without is the Alphabet Mix kit. This kit comes with bottle caps with consonant letters stickers on top and a die/cube that has all the vowel letters stickers on it. I enjoy this kit so much because there are countless ways you can use it. 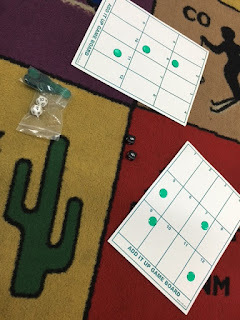 To coincide with my Phonics curriculum, I have the students roll the vowel die and then they use the bottle caps to make words using that vowel sound and sometime I just give them the vowel I want them to work on. 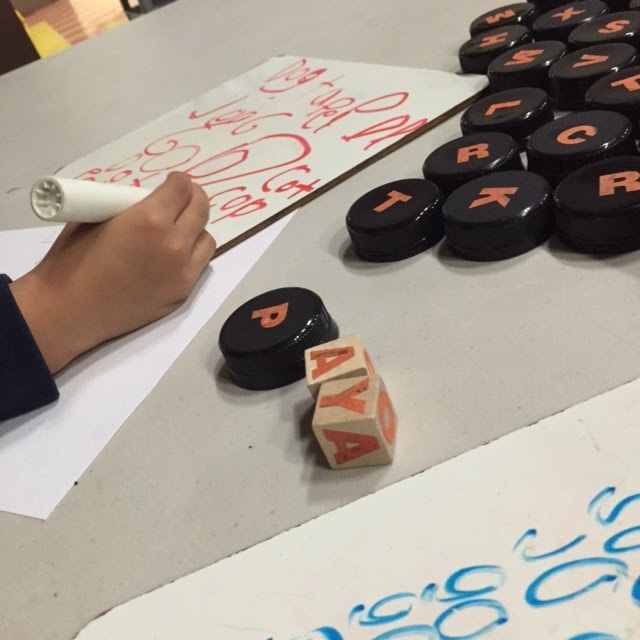 I have also given them a certain spelling pattern, such at –ed words, and then the students have to make words using that specific spelling patterns. I also use this kit by having students spell sight words for me or to relieve spelling test anxiety, I have the students use the bottle caps to spell the spelling words and then they record it on their own. Take it from me, these kits are a must have in your classroom and I would highly recommend these amazing kits. These kits have improved my students’ understanding and they thoroughly enjoy the hands-on experience these kits offer. I hope this has given you some inspiration for your own classroom and how to adjust RAFT kits to your specific teaching needs and make sure to check out these kits next time you are at RAFT!